Motorcycles carrying passengers in multi-colored outfits sped back and forth on 18th St. between Valencia and Guerrero this afternoon for the filming of the upcoming Netflix television series Sense8. J. Michael Straczynski, creator of the trailblazing science fiction series Babylon 5, and the Wachowski siblings, Andy and Lana, the writers and directors of the Matrix franchise, are heading the project. On Wednesday afternoon, police had cordoned off the two blocks needed for a dozen motorcycles to race back and forth. Crew members swamped 18th St., shouting “Rolling!” whenever a scene began. Sense8 tells the story of eight people spread over the United States, London, Berlin, Seoul, Iceland, Mexico City, Nairobi and Mumbai who have acquired psychic powers that allow them to communicate with one another, according to an interview given by Straczynski to zap2it. None of that was apparent from the motorcycle scene, which featured a mixture of Hells Angels-esque motorcycle chicks and bikini-clad women waving at an imaginary crowd. The zap2it article said the project will be similar to Stracyznski’s work on Babylon 5 and work by producers like Damon Lindelof in Lost in that it features a five-year story arc rather than a stand-alone 10-episode season. It was pitched for the long haul and its actors are in it for the long haul, with this first season focusing on the origin of the characters and their mental powers. Straczynski told zap2it that they’re playing this very close to the chest, and indeed the set was veiled in secrecy, with crew members unable to speak about the content of the series. 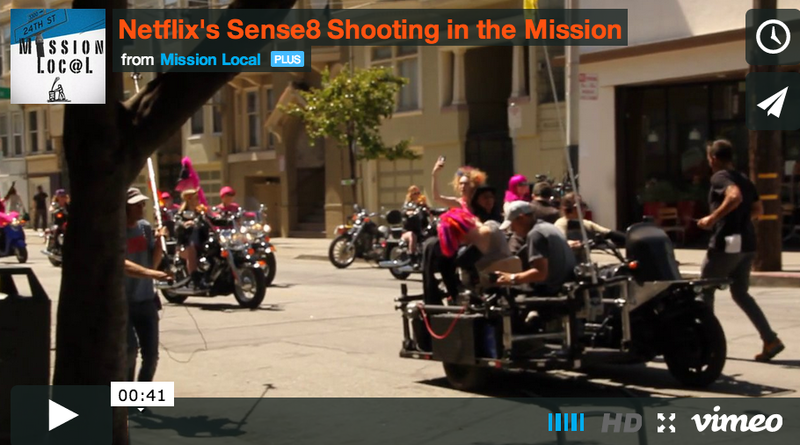 But a glimpse of Lana Wachowski with rainbow hair ahead of racing motorcycles tells you she’s involved in the San Francisco sequences. And it seems there will be more of them. “We’re shooting all over San Francisco,” another crewmember said. And with Pride just a few weeks away, it may be possible to get another peek of a series that brings together some of science fiction’s greatest minds.